Now the Spirit of the Lord had departed from Saul, and an harmful spirit from the Lord tormented him. Saul's attendants said to him, "See, a spirit from God is tormenting you. Let our lord command his servants here to search for someone who can play the harp. He will play when the harmful spirit from God comes upon you, and you will feel better." So Saul said to his attendants, "Find someone who plays well and bring him to me." Then Saul sent messengers to Jesse and said, "Send me your son David, who is with the sheep." So Jesse took a donkey loaded with bread, a skin of wine and a young goat and sent them with his son David to Saul. David came to Saul and entered his service. Saul liked him very much, and David became one of his armor-bearers.Then Saul sent word to Jesse, saying, "Allow David to remain in my service, for I am pleased with him." Whenever the disquieting spirit from God came upon Saul, David would take his harp and play. Then relief would come to Saul; he would feel better, and the harmful spirit would leave him. 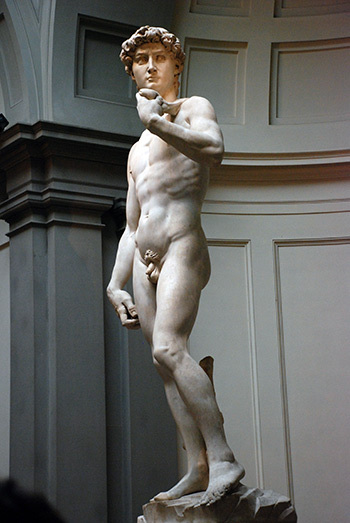 The famous statue of young David by Michelangelo. You can see it in the Galleria dell'Accademia, Florence, Italy.